Justin Bieber is not only one of the most successful artists of our generation but also a true trendsetter of the fashion world. While he’s always been a stylish dresser, his hair was always the most fabulous thing about his look. As such, young men have been looking up to the Bieb for inspiration for years now. 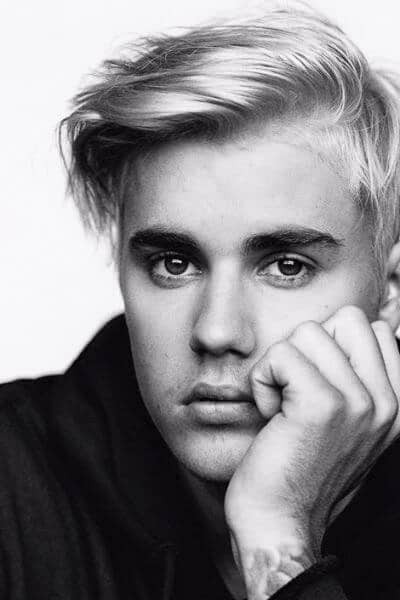 We have made a list of the 50 best Justin Bieber haircut ideas so that you can see all the excellent looks that the singer has had over the years. 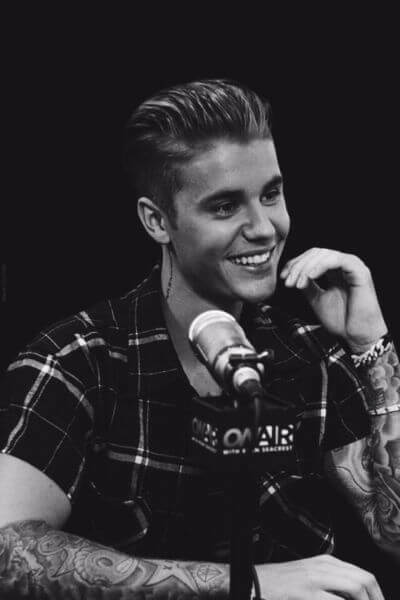 The long quiff hairstyle was one of the Bieb’s best hairstyling moves. This elegant look goes perfectly with his slick mustache because it adds a little bit of edge to it. As you can see, the Bieb is rocking the long combover look in the best possible way. By keeping it just the right amount of messy, he has managed to turn this clean cut look into a true fashion statement. This is one of the Bieb’s most controversial hairstyles because it is entirely off the charts. The long ash blonde side comb is incredibly daring and it is simply impossible to ignore. Beyond any shadow of a doubt, it is one Justin’s edgiest hairstyles. This is one of Justin’s cleanest looks and we absolutely love it. Notice how his faded sides bring out the texture and the wonderful golden blonde in his hair. 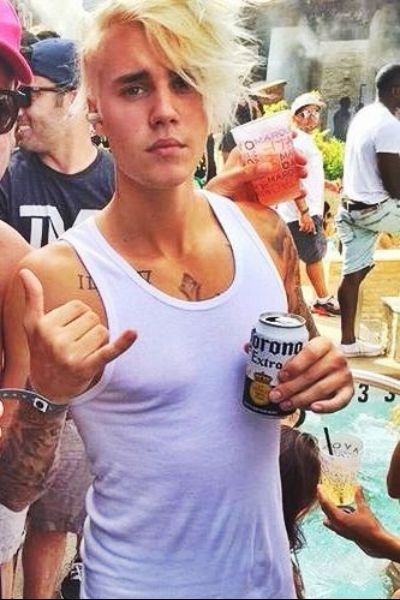 We love how the extreme ash blonde brings out Justin’s wild side. The contrast between his very blonde hair and his dark eyebrows is fabulous and we applaud is courage to choose such a daring color. 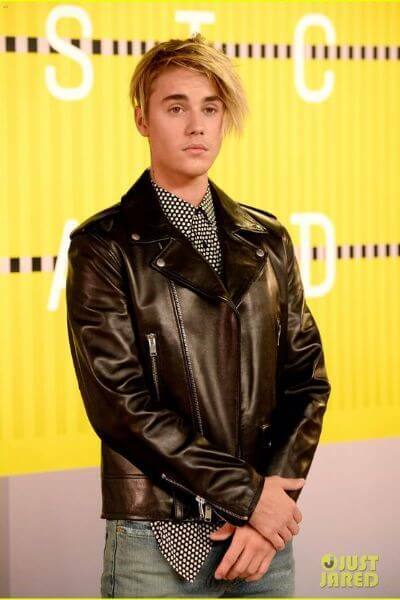 This short messy side comb is an excellent look for the Bieb because it makes him look elegant, yet edgy. 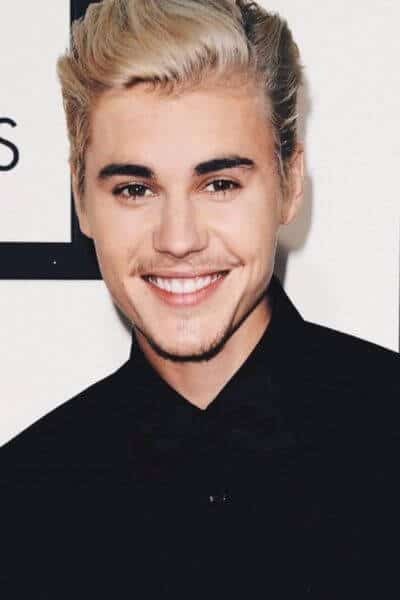 One of Justin’s most appreciated looks, the short golden blonde hairstyle is a clean cut look that suits any stylish man who wants a change of style. While Justin’s newest hairstyles have made him the talk of the fashion world, it was this long bangs hairstyle that made the Bieb the style icon he is today. This is an excellent look for boys and men alike and it is Justin’s signature haircut. This is Justin Bieber’s most eccentric cuts to date and it is absolutely stunning. This bold look is not for the faint-hearted because it is guaranteed to catch everybody’s eye. 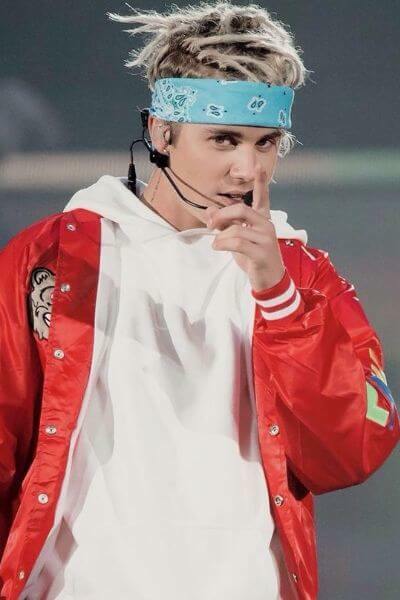 This is the most rebellious look that Justin has had over the years and we absolutely love it. 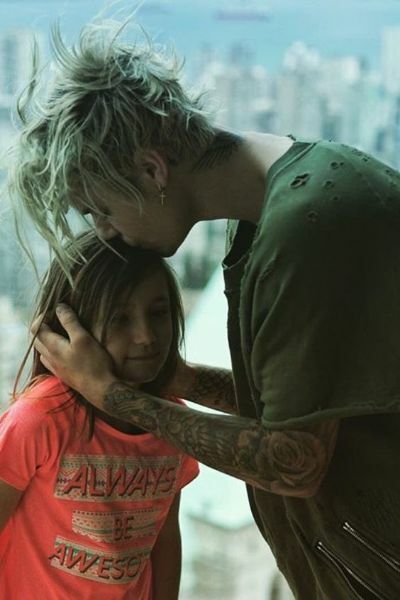 These messy dreadlocks make for an edgy look that brings out the Bieb’s wild side. 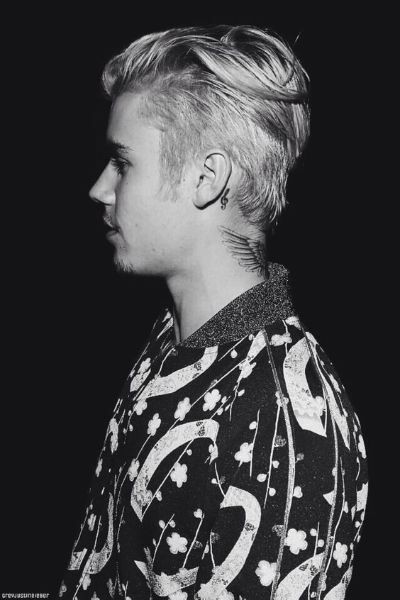 Justin Bieber’s undercut with spikes is one his most appreciated looks. It is a classic undercut hairstyle with subtle faded sides and dazzling spikes and it looks fantastic. Justin rocked this long blonde messy combover look on his Comedy Central Roast. This hairstyle became iconic in the fashion world because it is the ideal combination of elegance and edge. This extra short even cut marked Justin’s passage from his world-famous spiky do to the edgy hairstyles he is rocking today. 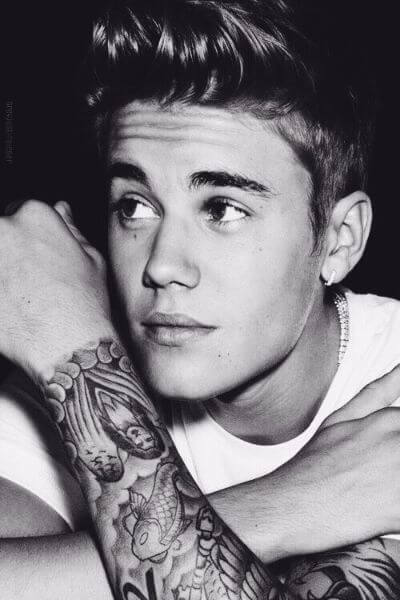 It is a very simple cut that looks amazing on the Bieb. Yet another one of Justin’s iconic hairstyles, the long side bangs look has made him famous in his early days. If you want to style your hair like Justin, you will need to use a strong hairstyling mouse to keep your bangs in place. 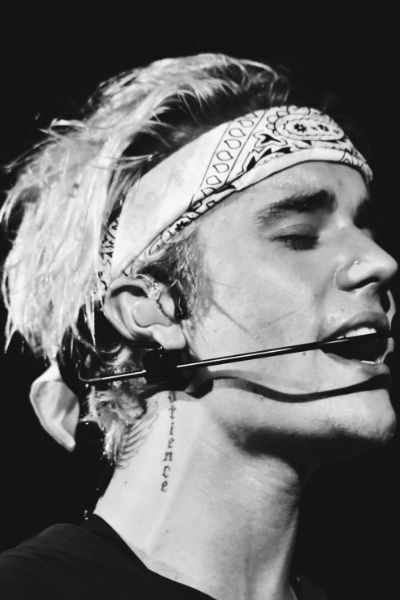 The top knot look is one of Justin’s best looks because it is remarkably adventurous. If you want to try it for yourself, remember to keep your sides shorts and to tie your hair up in a simple knot. 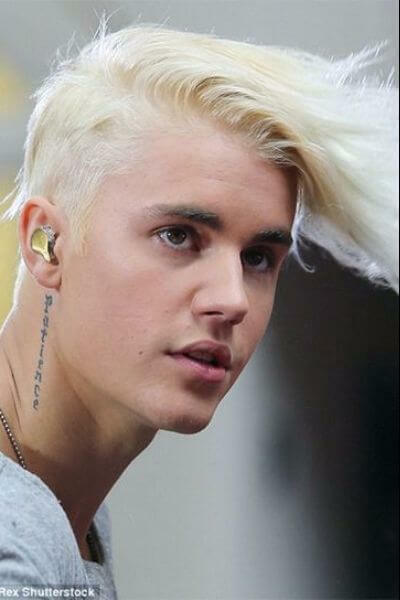 Justin Bieber took the fashion world by storm when he changed his color to this eye-popping ash blonde. 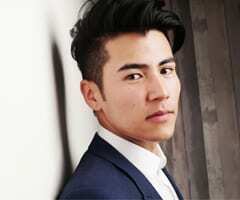 His long undercut with subtle faded sides looks fantastic even out of bed, as you can see in the picture below. Justin looks amazing with this slicked back undercut hairstyle because it brings out his more elegant side. If you want to replicate it, all you have to do is use a bit of hair gel to slide your hair back all the way. 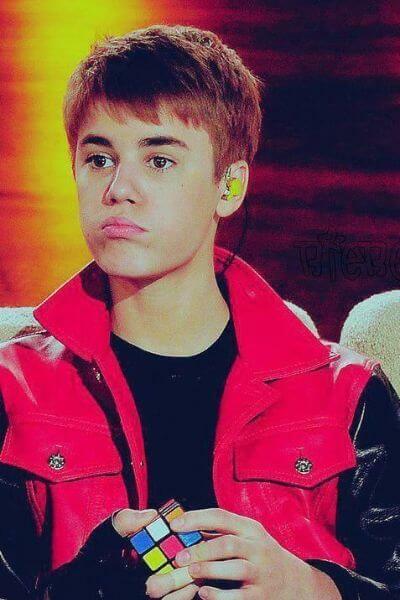 This classic cut with short bangs was Justin’s very first look. It is a very simple cut that any boy can try out. The signature mark is the layered bangs that give this hairstyle a very special edge. 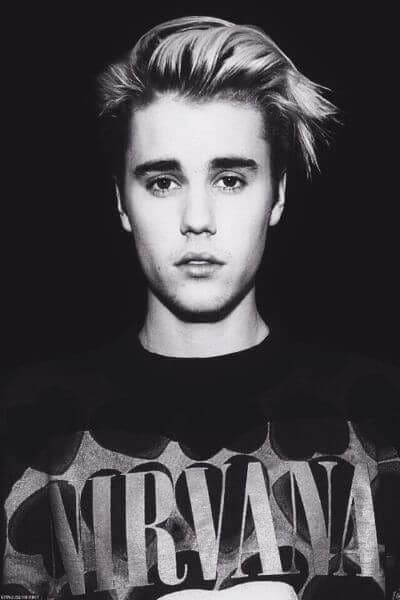 Known as one of Justin’s best cuts, the messy side comb is an excellent look for the adventurous singer. We love how the classic side part brings out his elegant side, while his messy long faded sides give a hint of rebellion to the look. This messy hairstyle is one of Justin’s most recent looks. 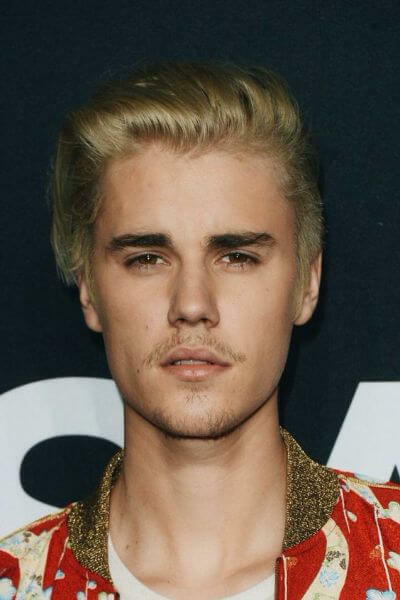 Between the long faded sides, the side-slicked bangs and the stylish mustache, it is quite clear to everybody that the Bieb is all grown up. 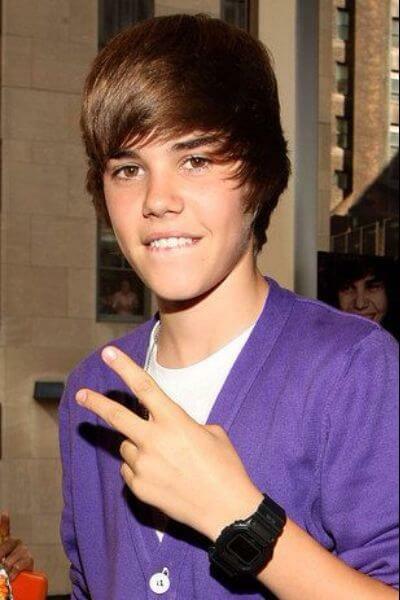 While this is one of Justin’s early looks, it is by far one of his most famous hairstyles. This short cut has been replicated by men and women alike because everybody wants a bit of Bieber’s style. We simply cannot get enough of Justin’s long blonde bangs. This stylish do has become a fashion statement because it is unlike anything Hollywood has ever seen before. 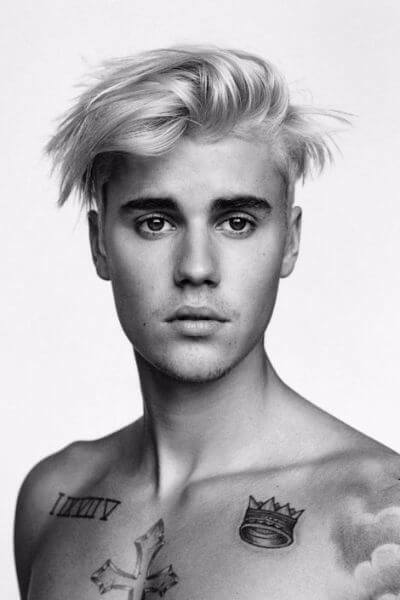 If you have long hair and you are looking for a styling idea for your combover, then turn to the Bieb for inspiration because his messy top knot/ponytail is brilliantly edgy. In fact, the messier, the better. 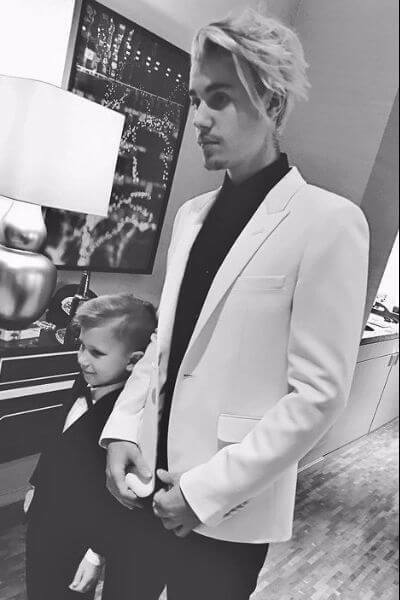 This is one of the Bieb’s latest looks and one of our favorite of his hairstyles. The musketeer goatee is an unexpected style choice for Justin, but it looks amazing on him, so we applaud his courage. From the black roots to the ash blonde tips, Justin’s blonde ombre hair looks amazing. This long combover accentuates the flawless combination of colors in his gorgeous hair. This spiky undercut will forever be known as the Justin Bieber haircut because the singer has made it his signature style. 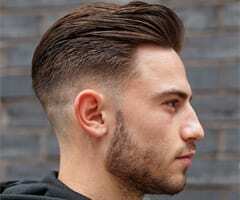 It is actually one of the most popular hairstyles for boys of all times. This is one of the best ways to style your long Justin Bieber haircut. We love the rebellious wavy combover and the subtle side part because they build an effortlessly stylish look that anyone can do. 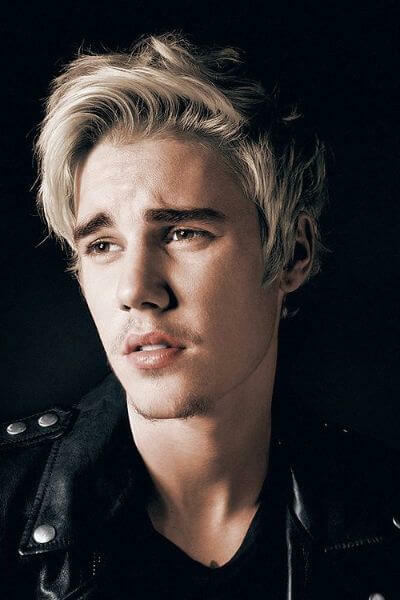 This is one of the classic Justin Bieber haircut ideas that we have chosen for our list because it is an elegant look that he has adapted to his unconventional style. This is the latest of Justin’s hit hairstyles and we cannot get enough of his brilliant take on this unique look. We love the daring color, as well as the crazy side comb that he has styled to perfection. This out of bed hairstyle suits Justin Bieber perfectly because it represents his unique style. This messy do is perfect for young men who want to stand out as rebellious and daring. As you can see, Justin looks amazing with this classic hairdo. His faded sides are layered to perfection and his long blonde side comb looks absolutely amazing. 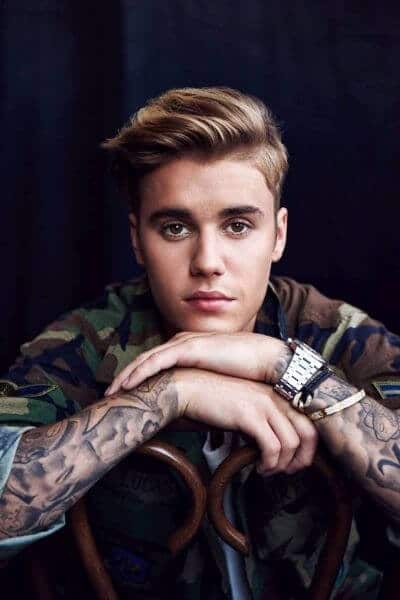 This is a stylish look from the Bieb’s earlier days, but it is still one of the most appreciated Hollywood-inspired hairstyles for men. His short combover looks fantastic and it has turned Justin into the fashion icon he is today. Justin Bieber has taken the undercut hairstyle to an entirely new level with this messy ash blonde look. With a minimum styling effort, you could look like the fabulous singer, so give it a try! 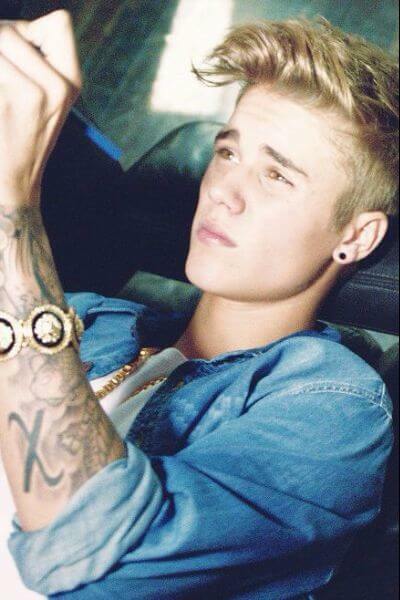 This upward pompadour is one of the most famous Justin Bieber haircuts. 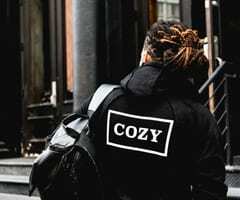 It has served as a source of styling inspiration for men and women alike who wanted to make the Bieb’s fabulous style their own. 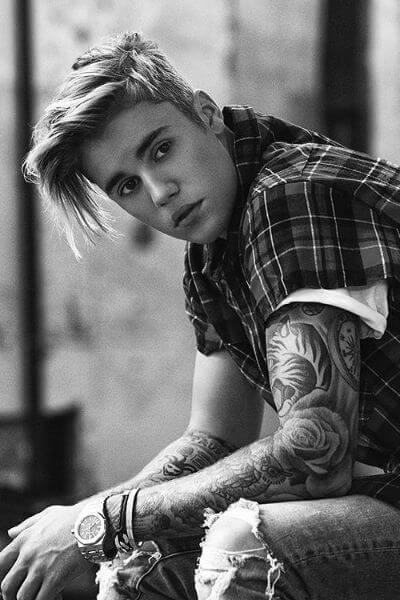 Justin Bieber has made the undercut one of the decade’s most popular hairstyles. Aside from his fabulous layered sides, this look has become famous for the fabulous edgy spikes. This is one of Justin’s best looks because it gives an elegant touch to his adventurous style. We love his black roots and lovely blonde hair, but it’s the messy side bangs that make this hairstyle a true fashion statement. 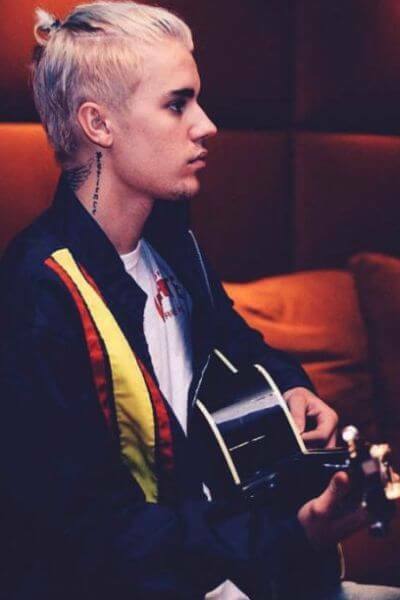 Justin Bieber added a personal touch to the classic pompadour hairstyle and the results are absolutely stunning, as you can see in the picture below. Use only a dash of hairstyling mouse to get the Bieber pompadour. Justin Bieber rocked the golden blonde style with this short haircut that highlights the lovely texture of his hair. While it may be one of the Bieb’s simpler hairstyles, it is also one of his best. 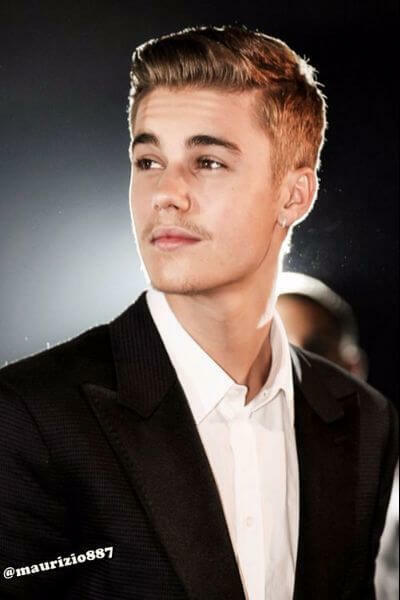 While Justin’s undercut may adhere to the classic outlines of the hairstyle, his musketeer mustache gives this look a fabulous retro touch that we are simply in love with. 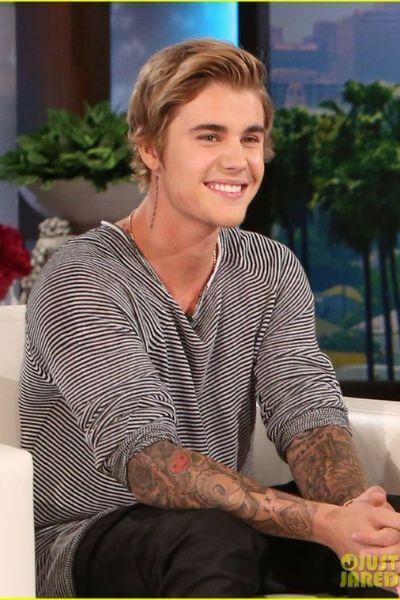 When Justin was outgrowing his shorter cuts, he has resorted to this messy long hairstyle that made him look perfectly stylish during his transition period. If you are also growing out a short cut, try out this Justin Bieber haircut for a fabulous look. If you were curious about the look that Justin was going for while growing out his hair, this edgy asymmetrical cut was his styling goal. 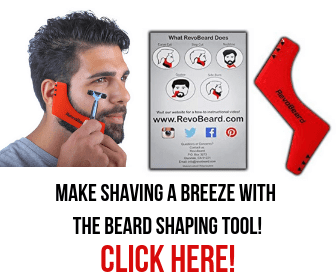 It is brilliantly messy, yet layered to perfection, which makes it an excellent source of inspiration for adventurous men looking for a change of style. Justin Bieber’s signature upcomb is one of the it hairstyles of the decade. With just a bit of styling mouse, you can get this amazing do. Justin is rocking this messy long hairstyle. This sauvage side comb is the easiest way to a rebellious look with a hint of Hollywood sparkle. Justin Bieber has taken the messy hair look and made it his own with this amazing haircut. This hairstyle shows his true star power and it is simply outstanding. Justin Bieber has revolutionized spiky hairstyles with this dazzling look. In fact, this is one of the hairstyles that have made the Bieb a world-famous fashion icon. This ash blonde undercut looks amazing on Justin. We love his take on messy hairstyles and this is one of his best sauvage looks because it is unpredictable, yet brilliantly stylish. We love Justin’s headband looks and this is one of his best ones to date. It is extremely easy to replicate and you are guaranteed instant star power. This is one of Justin’s best looks from his early days of stardom, but it is a stylish hairstyle that has marked fashion history. This is one of the edgiest hairstyles that the Bieb has had over the years. The extreme faded sides contrast perfectly with his long golden bangs and the result is worthy of fashion history. 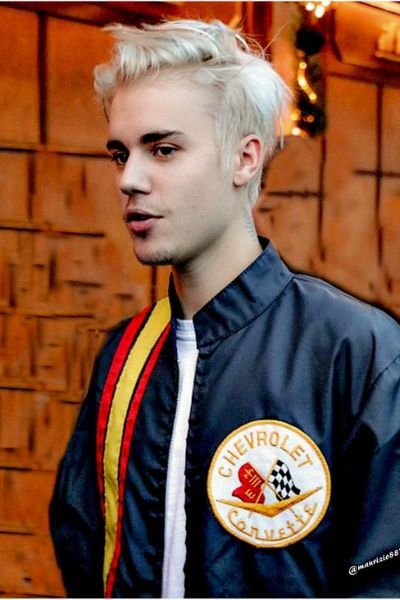 We love Justin’s take on the Eminem ash blonde hairstyle because it fits him to perfection. The Bieb looked fabulous with this short even cut and he has rocked the ash blonde look. 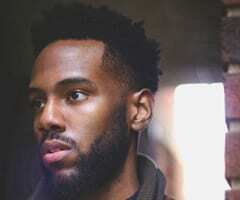 Justin’s asymmetrical cut is a look worth replicating because it layered flawlessly. His musketeer goatee completes the look by adding a special edge to his adventurous look. There are so many Justin Bieber haircut ideas out there because the singer is one of the most stylish artists of this generation. From his early signature side bangs to his stunning ash blonde asymmetrical do, the Bieb is a true trendsetter and one of the loudest voices in fashion history. Interested in more celebrity hairstyles? 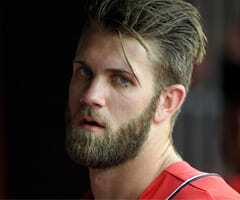 Check out Bryce Harper’s haircut to draw more insporation.